As part of the commercial side of our business we work with housing developers to design, build and install bin and bike storage for large scale projects. We work directly with the project architects to provide a solution that is in keeping with the building scheme's style and ultimately develop a long term, cost effective product. Over the past two years we have worked with two of the country's biggest developers; Berkeley Homes and Countryside Properties on two very different projects and to date we have installed over 300 units. From the adjacent pictures you can see how an initial CAD design translates into a final product. The product that is featured was specifically designed to maximise the use of space and allow for the storage of 2 bicycles in a smaller footprint than was previously possible. 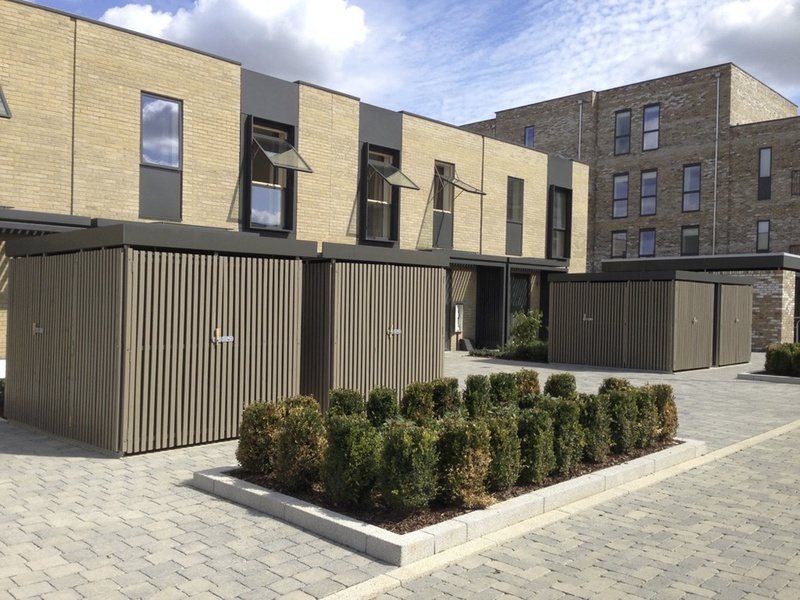 Five bin and bike storage units installed in Cambridge for Countryside Properties - Examples of an alternative design. We pride ourselves on using the highest quality materials whilst maintaining an affordable cost. This system ensures that all of our builds are durable and long lasting. For our outer cladding and walls we use Mediate Tricoya - a specialised particle board that is guaranteed by the manufacturer outside for 50 years. Our frame is constructed from anodised aluminium making it both lightweight and strong. In addition to this we use EPDM rubber for our roofs and secured by design standard fixings. We work with developers and specifiers to ensure compliance with current government regulations. The standard for home quality from new builds is currently undergoing a transition from the Code for Sustainable Homes to the Home Quality Mark. The finalised version of the new nationwide standard is due to be published in October 2015. We are closely monitoring these developments to ensure that our products continue to comply with the appropriate guidelines and provide a valuable service to developers. For more information on this please visit the home quality website here.